Scaffolding inquiry – evaluating sources | What did you learn at school? Identify the origin and purpose of primary and secondary sources. Locate, compare, select and use information from a variety of sources as evidence. Draw conclusions about the usefulness of sources. Identify the origin, purpose and context of primary and secondary sources. Process and synthesise information from a range of sources as evidence in an historical argument. Evaluate the reliability and usefulness of primary and secondary sources. Firstly, we provide prompt questions for students to answer to encourage them to think about the reliability and usefulness of sources. The types and categories of questions increase in complexity as a progression of learning. In line with the curriculum, students of years 7 and 8 respond to issues of origin, type, purpose, perspective and usefulness of the source; in addition, students of years 9 and 10 also respond to issues of context, trustworthiness and corroboration. Secondly, we provide the prompts in different ways, depending on the ability level of the students. 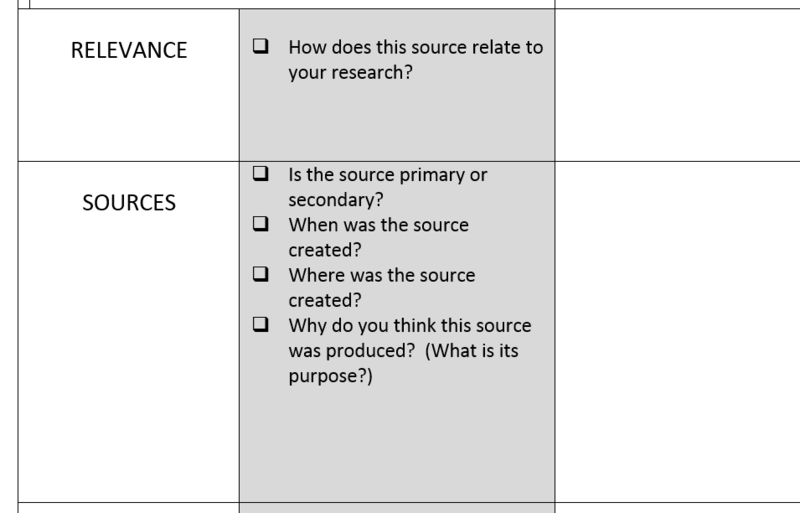 Students of years 7 to 9 are provided with a source evaluation scaffold with specific questions to complete (with the questions and categories for their developmental stage). Students of year 10 are provided with a scaffold, but are encouraged to write their own detailed evaluation that takes all of the relevant issues into account. This establishes a good foundation for the requirements of senior history subjects.